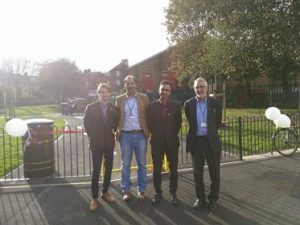 This week (Thursday 4 October 2018) saw a sunny celebration event to mark the official opening of the new Council housing on the Garnets in Hunslet Moor, and the reopening of a refurbished play area in the neighbourhood. The event saw 100+ local people gather for a free funday event featuring sports, inflatables, food, stalls, music, and craft; and a ribbon-cutting event at the playground, featuring Cllrs Mohammed Rafique, Richard Lewis, Mohammed Iqbal, and Paul Wray. And local residents, especially those of the 25 new houses, were not short on enthusiasm. Thahmina told us: “The park’s great, the kids all love it”. Simon said: “We were squashed up into a tiny house before, but the new one is brilliant – and the area’s not bad”. And Clara added: “We’re very happy. Our old house was far too small, and the new houses are good quality. We use the park too – it’s nice”. The new public playground is on Garnet Place, just one minute’s walk from Dewsbury Road – behind Iceland. Local residents are looking to set up a ‘Friends of’ group to maintain it: get in touch to find out more. Plans are still forming for the former playground site behind the Vale Centre: watch this space. I am a former resident of Garnets and I hated the area. Sadly, there are class A drugs aplenty and ASB is rife! There are some good people in the area, but are few and far between. You also get scallies gathering in the Garnets and several have bullied and intimidated certain vulnerable people. I’m very happy now I no longer have to see or hear anything to do with that part of Leeds! Crime-infested dump of epic proportions. They should have levelled the entire place.